How many ml's is in the four toners for the HP LaserJet CP 1025 printer? Unlike ink cartridges, toner cartridges don't have an ml capacity as they aren't a liquid. The capacity of toner cartridges is expressed as a page yield. How many cartridges are used in the HP LaserJet CP1025 colour printer? We're wondering whether the new HP Colour LaserJet CP1025 printer comes with free cartridges or if we have to pay extra for the cartridges? This might depend on where you purchase the printer. As we're only a supplier of the HP CP1025 cartridges rather than the printer itself we can't confirm this for you. In most cases a new printer will be bundled with a set of starter cartridges. The starter or SETUP cartridges are designed to get your printer going but will only contain a vey small amount of toner. Once they run out you'll need to buy replacement HP CP1025 toner cartridges such as the ones listed on our website. We offer the cheapest prices on HP Colour LaserJet CP1025 toner and these cartridges should last a lot longer than the starter cartridges. How do you replace the toner for a LaserJet Pro CP1025? The first one can be removed but the other colours can't be replaced. Please advise? I'm setting up a business. I'm alone and need a reliable, cost-effective printing facility. I work from both a laptop and an iPad2. Is the printer I have just looked at , the HPCP1025, a sensible purchase for just everyday needs of about 25-30 pages a day both monochrome and colour? I have to be careful that I buy only a reliable, cost effective, no fuss or frills wireless printer. Please advise? As we do not sell printers we are probably not best placed to advise you on this matter. However, the HP Colour LaserJet CP1025 does seem to match many of your criteria and does have integrated wireless capability. You can see our review of the HP CP1025 printer at the bottom of this page for further guidance. Any time your HP CP1025 printer runs out of toners, where on earth do you look before anything else? Cartridge Save is the leading supplier of cartridges for the HP CP1025 printer in the United Kingdom. Our company's mission is to provide nothing less than top quality laser toner cartridges. Not only do you have an assurance of top of the line laser toner cartridges, we will get your purchase to you promptly for free! We are a business that's sincere when it comes to offering brilliant affordability along with first-rate customer support. We're striving to keep expenses down with free delivery with each purchase . Should you place an order today, your order will arrive by the next day. Have satisfaction if you place an order with Cartridge Save because of our company's rock solid thirty day cash-back guarantee. In case you experience any hassles using your HP CP1025 toner within thirty days after purchase simply post it to us for a 100% reimbursement. If you need to save cash, you need to shop from Cartridge Save! 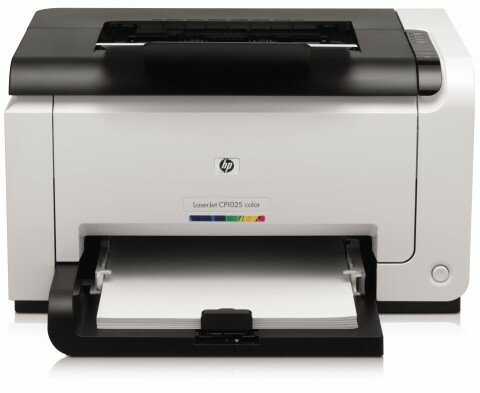 The HP Colour LaserJet CP1025 printer is an affordable, compact printing solution for the home office or small business. Claiming the title of industry's smallest colour laser printer, the CP1025 also is the most energy efficient. Packed with features, this robust printer has integrated wireless for network connectivity and accommodates multiple paper types. Overall, the LaserJet CP1025 is a sturdy colour laser printer that will bring productivity and colour to your small office environment. World's smallest colour laser printer is no small title. The CP1025 measures a mere 39.9 cm wide by 40.1 cm deep and 25.2 cm tall. With this small footprint, no space will be wasted in your office while retaining the power and brilliance of colour laser technology. HP CP1025 toner cartridges, the HP 126A series (Black, Cyan, Magenta, Yellow) yield 1,000 pages of rich colour giving a cost-effective alternative to traditional expensive colour inkjet printers that only yield 400 pages or less per cartridge. The LaserJet CP1025's 126A series drum cartridge lasts for 14,000 black pages and up to 7,000 colour pages. The media tray supports multiple paper sizes including envelopes and standard photo sizes. The CP1025 can even print on transparencies, labels and cardstock. The paper tray accommodates 150 pages and can hold 50 pages in the output bin, able to handle large print jobs. Affordability is one of the best assets of the CP1025. Colour laser functionality is finally available to the home office and small business without breaking the bank. Dependable, long lasting colour HP CP1025 toner cartridges provide dazzling presentations and even photos. If regular monochrome printing is needed, the CP1025 churns out 17 pages per minute, which is respectable for a colour laser in this class. The ability to print on multiple types of media is a definite plus giving the CP1025 flexibility for a variety of projects and presentations. Compatibility is not an issue with drivers available that work with both Windows and Mac computers both directly, networked and wirelessly. As a low-end colour laser printer, the colour print speed is only 4 pages per minute making colour print jobs crawl along at a snail's pace. In comparison, most colour inkjet printers reach speeds of up to 25 pages per minute. There is a cost savings involved as well as overall page yield but it hardly overcomes the reduction in speed. Having such a small footprint means that the paper tray can only handle 150 sheets making replacing paper a frequent operation. Duplexing is also not included unless done manually.